La Virgen & the Aztec goddess | Real in L.A. There are images of the Virgin of Guadalupe all over town—even tattooed on guys’ chests—but this mural, found in Lincoln Heights, puts the Virgin in unusual company: Next to her is a representation of the Coyolxauhqui stone, an enormous, Aztec bas-relief disk 3.25 meters across. I first heard of Coyolxauhqui when I toured Central Mexico with other women looking for feminine aspects of the Divine. And I got to see the actual Coyolxauhqui stone when I visited the museum of the Aztec Great Temple in the center of Mexico City, the city formerly known as Tenochtitlan. An Aztec artist magnificently rendered the goddess in rose-pink stone, her extravagant adornments depicted in detail. Yet she also is shown dismembered, her arms, legs torso and head rearranged artfully to fill out the circular frame. Coyolxauhqui, you see, was killed by her brother, the solar-and-war god Huitzilopochtli, in an archetypal battle representing masculine v. feminine, the sun v. the night, the Aztec v. their oppressors (though not, apparently, aggression v. harmony since Huitzilopochtli killed his sister as she marched with her troops to kill their mother). The Coyolxauhqui stone was found among the remains of the great Tenochtitlan pyramid, which had two shrines at its apex: one for the rain god Tlaloc, the other for Huitzilopochtli. The dismembered Coyolxauhqui lay at the foot of the steep stairway leading to her brother’s shrine. It’s thought that ritual re-enactments of the Coyolxauhqui-Huitzilopochtli myth took place at the war god’s shrine, with the bodies of sacrificed captives rolled down the steps to land on the Coyolxauhqui stone, the sister once again (symbolically) vanquished by her brother. What is the Virgin of Guadalupe doing in the company of these two unsavory Aztec deities? 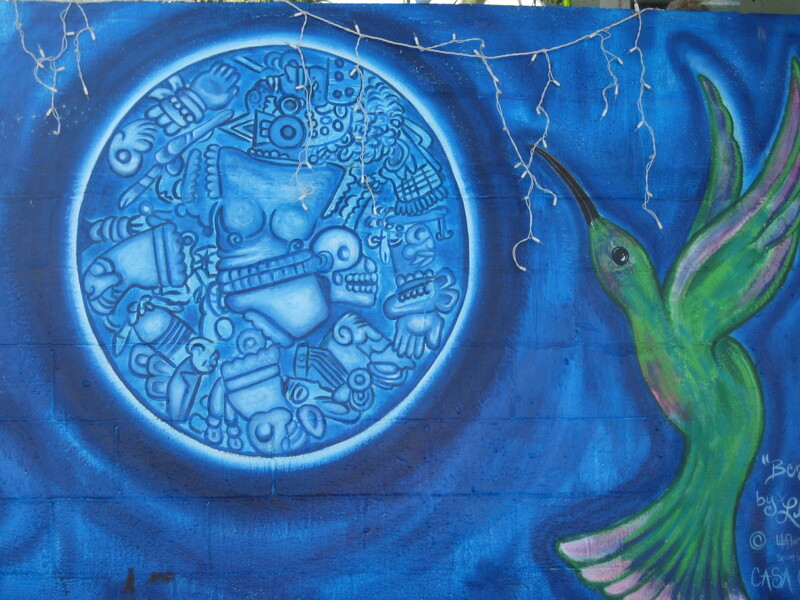 (Huitzilopochtli is represented in the mural by the hummingbird, one of the god’s disguises.) It is said that the epic battle of brother and sister took place on a hill, much as the Virgin revealed herself to Juan Diego on the hill of Tepeyac in 1531; I suppose there’s that connection. Perhaps the muralist simply wants to point out the continuity between the two traditions. Before a shrine to the Virgin preempted her, Tepeyac was dedicated to the Aztec goddess Tonantzin. (Some would even say that the Virgin was, um, discovered by Spanish friars to encourage the native peoples to switch allegiance from their old religion to the friars’ new one.) In lieu of Tonantzin in this mural, there’s Coyolxauhqui, who got a pretty raw deal from the Aztec clerics and deserves a little positive regard. Then again, perhaps the dismembered Coyolxauhqui is most apt. Seems that devotion to the Virgin of Guadalupe was promoted by Dominican friars, while Franciscans called it the idolatrous worship of a painted image. This dispute was aired publicly at a hearing led by the Archbishop (himself a Dominican), the upshot being that control of the shrine at Tepeyac was wrested from the Franciscans and given to the Dominicans. Adoration of the Virgin of Guadalupe continued, given to us via a battle between religious siblings, not unlike the one between mythic brother and sister. 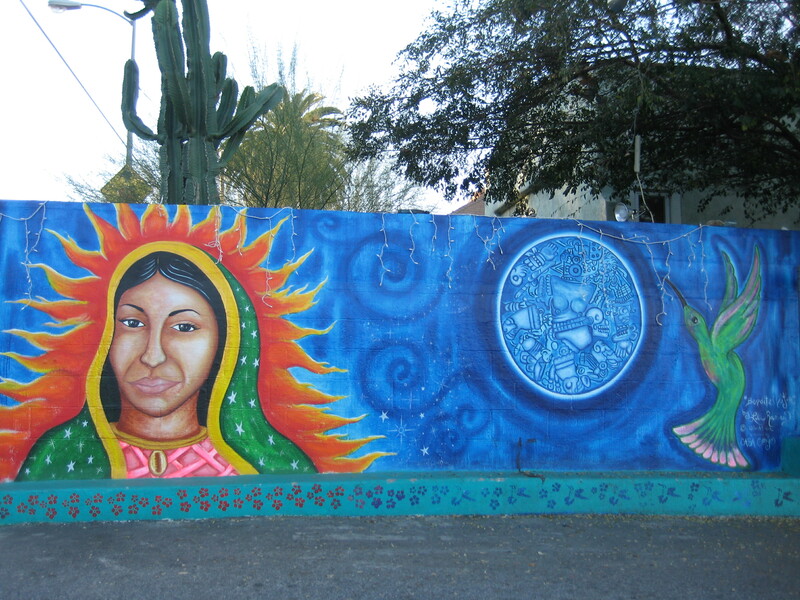 The mural, sponsored by Casa Coyo, is named “Mujer Bendita,” and it was designed & painted by Lilia Ramirez, “Liliflor” or Liliflor Art. Muralis/Artist name: Lilia Ramirez “Liliflor” or Liliflor Art you can see the credits in the mural the title is “Mujer Bendita” if you have any questions or inquiries regarding the artist you can check out casacoyotl.org. Thanks for sending me the correct attribution. I’ve put it into the body of the post with links to your FB page and the casacoyo.org website. Wow great point of views. Great work Lilia! The hidden gem of an artist is here in East Los Angeles. You are currently reading La Virgen & the Aztec goddess at Real in L.A..